If you’ve been following what we’ve been doing recently, you’ll know that we’ve moved out of our Burton Road office and are in the process of creating a home office. All very lovely, but logistically quite difficult when we’re trying to fit over four floors worth of accumulated office stuff into a three bed terrace. So, much of the last week has been spent negotiating piled up boxes, manoeuvering our way around additional desks and chairs and generally living in a little bit more chaos than normal. So, by Friday afternoon we really had had enough and so headed off to Thyme Out Delicatessen on Nell Lane for a bit of calm. 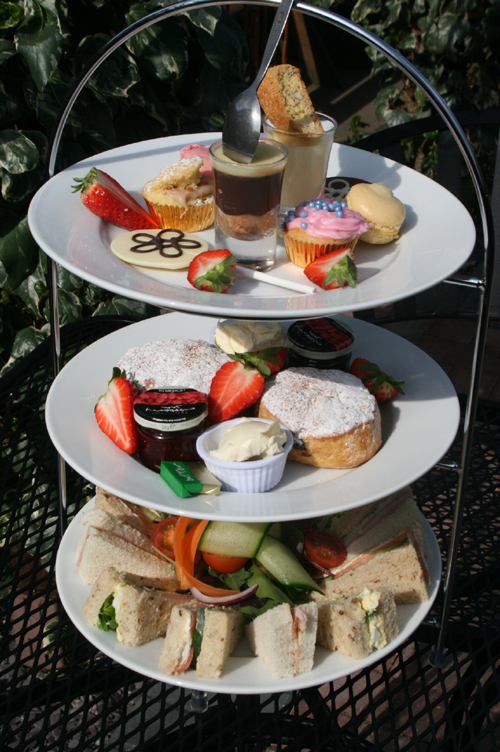 Accompanied by two individual pots of tea, the three tiered cake stand was packed with delicious treats. The bite-sized (although packed with filling – no scrimping here!) 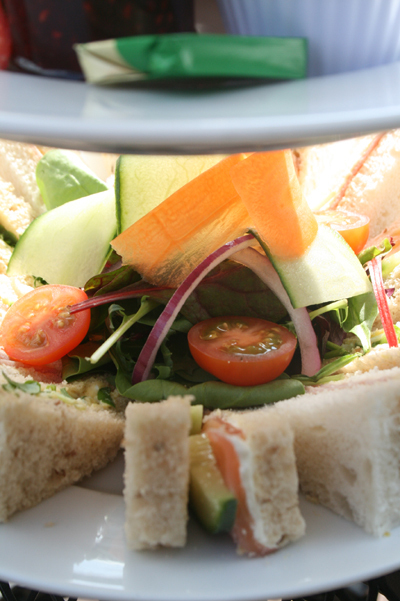 triangular sandwiches were a mix of granary and white bread and garnished with cucumber curls, cherry tomatoes and baby leaves. We had a selection of egg mayonnaise & cress, smoked salmon & cream cheese and honey roasted ham. 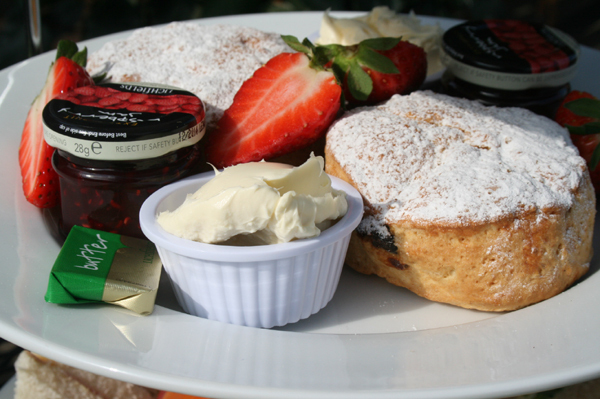 The next layer consisted of two large freshly baked on the premises (still warm, in fact) date scones with clotted cream, cutesy pots of strawberry jam and big, fat, juicy strawberries. For someone who generally prefers savoury over sweet, these were delicious – and although large in size, they were light so not over-filling. For the sweet-tooths of you out there, the top and final layer will probably be a favourite. A sweet mix of homemade French macarons (made by Ben himself), two mini-cupcakes (we had mini M&M and mini Victoria sponge), lemon posset & shortbread finger (divine!) and a chocolate and orange ganache with a crushed amaretti biscuit base – would love to be able to comment on this, but sadly didn’t get a chance to taste as it seemed to disappear very quickly across the other side of the table. There were also more fresh strawberries – and just in case there wasn’t quite enough sweetness, two chocolate lollipops – one milk chocolate and the other white chocolate. 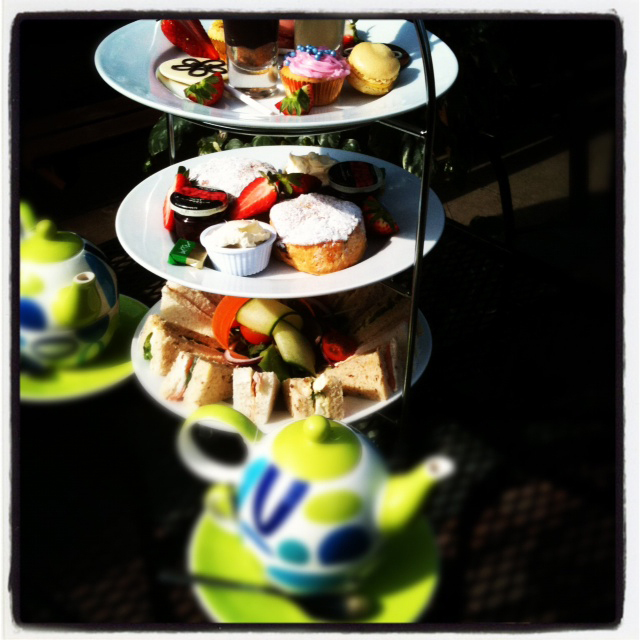 Afternoon Tea at Thyme Out Delicatessen is £11.95 per person (minimum of 2 people) and this includes tea or coffee. Please take our word for the fact that is very filling and there’s lot of it, so definitely value for money. 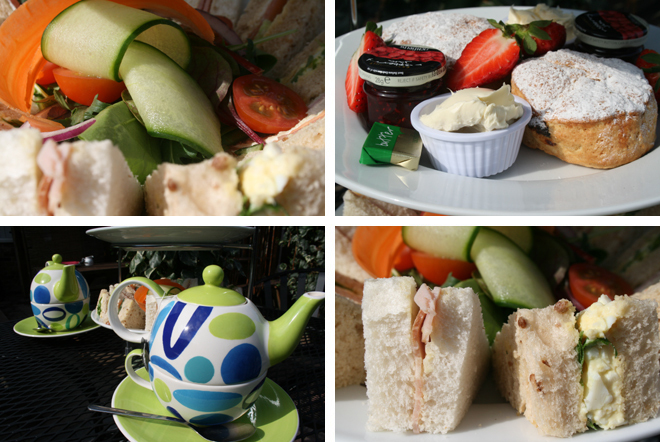 And, if you’re lucky enough to be able to sit outside in the garden, it does feel like a very naughty, decadent mid afternoon treat – for just over £10. 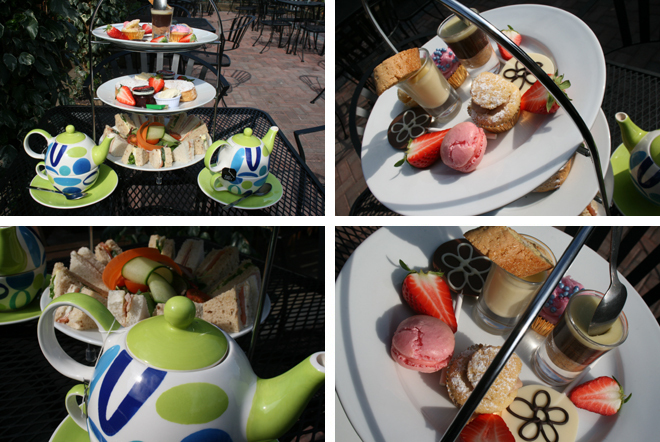 On Sunday 15th April, to celebrate the end of the West Didsbury roadworks, you can try Thyme Out’s Afternoon Tea with 20% off – well recommended!